The painting, which was probably kept by the painter's family, is one of a series of Flemish works acquired in 1783 by Marcantonio Borghese. 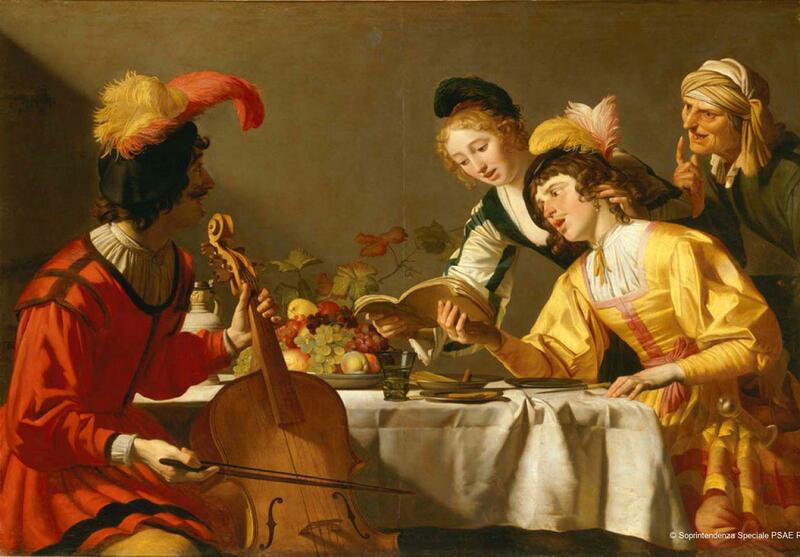 Gerrit van Honthorst, better known in Italy as Gherardo delle Notti, fitted in perfectly with the followers of Caravaggio in Rome, who revisited and reworked Merisi's favourite subjects, especially the secular themes. This piece, which dates from 1626–1630, apparently shows a simple musical theme, although in fact the composition hides a moral meaning. Typical of the art of the Counter-Reformation and particularly esteemed in the culture of the Netherlands, the artist's homeland, are themes related to allegories intended to express moral meanings. In this case, music, an excellent, virtuous, but also ephemeral art, is represented by an old woman who, in pointing to her toothless mouth, appears to be warning the three youths playing a concert of the fleetingness of youth and beauty. The subject also reveals the trick being played on the young man who, intent on singing, fails to realise that the maiden is taking his earring, with the complicity of the old woman, who is ready to slip it into her pocket. The theme of the trick is related to the allegorical evocation of the five senses: hearing through music, sight in expressive looks, taste through wine and food, touch by the gesture of the seductress, and smell through the nose, which the old woman appears to be pointing to. Special attention is paid to the table, where a basket of fruit is clearly visible. This element combines with the others in a sort of pastiche, the figurative motifs borrowed from famous Caravaggesque works, which also influenced the neutral choice of background. Gerrit Van Honthorst, called Gherardo delle Notti, absorbed the influence of Caravaggio during his stay in Italy (1610–1620). The subject, the composition, the still life on the table, the light falling on the left, all are quotations from Caravaggio's works. The Borghese Collection was acquired by the Italian State in 1902. Della Pergola, P., Galleria Borghese. I Dipinti, II, Rome, 1959, n. 239, pp. 165–166. Economopoulos, H., in I colori della musica. Dipinti, strumenti e concerti tra Cinquecento e Seicento, exhibition catalogue (Rome), Milan, 2000, cat. 48, pp. 216–217. Herrmann Fiore, K., in Degustazioni d'arte. Enologia mitica, spirituale, simbolica e metafisica nelle collezioni pubbliche di Roma, Rome, 2003, pp. 58–59. Copyright image: Archivio fotografico Soprintendenza Speciale PSAE e Polo Museale della Città di Roma. Sofia Barchiesi, a graduate and specialist in Art History and recipient of a scholarship from the School of Mediaeval and Modern Art History at Lumsa University, has been working with the Superintendency for Historical Artistic Heritage and the Museums of Rome since the late 1980s. She was responsible for cataloguing the art of the region and museums of Rome, studying the period of the Counter-Reformation particularly closely. She works with journals and writes essays, alternating her research and teaching work.